California Supported Living Network - Monica Venice and Trips, Inc.
My daughter, Monica, has been friends with Trips Inc. founder, Jim Peterson, since they first met in 1980 at the Special Olympics. Monica has taken a trip every year since 1999, including a Hawaiian vacation where she met her fiancé Barry, a Trips Inc. traveler from Maryland. Barry and Monica have been dating for 10 years and his family has become good friends with our family. My husband, Bob, and I believe that Monica got the travel bug from us. She loves to explore the world with her peers but says she prefers traveling with Trips Inc. instead of with us because she has more fun hanging out with her friends! Monica and has made several friends through Trips Inc. and they like to coordinate their Trips Inc. adventures so they can travel together. Monica encourages everyone to experience a vacation with Trips Inc. because the chaperones take good care of the travelers without hovering over them. I really appreciate the way Trips Inc. chaperones instill Monica with a sense of independence while providing the level of supervision appropriate for her needs. I’ve advocated for Monica and others with devel- opmental disabilities for 45 years. I’ve worked hard to integrate Monica into challenging and stimulating environments. I decided to put my money where my mouth was by signing her up with Trips Inc. and clearly, it was the right deci- sion. Monica continues to shine and experience the world. More importantly, the world gets to experience Monica! 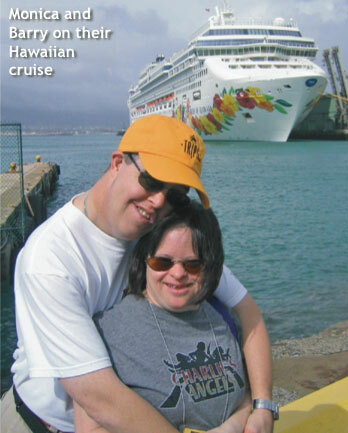 Award-winning Trips Inc. Special Adventures provides all-inclusive vacation packages for people ages 16 through adult with intellectual and developmental disabilities. The foundation of Trips Inc. Special Adventures is special education. Our expertise is evident in our affinity for, and sensitivity to, those with special needs. Our founder and executive director, Jim Peterson, has a proven track record of over 27 years of leadership and expertise in both areas of special education and travel. During that time, he’s organized over 600 trips throughout the United States and internationally, providing cherished memories to over 6,000 travelers from all 50 states. Trips Inc. consistently receives rave reviews from our participants, their parents and caregivers. Plus, our innovative organization has earned high praise featured in many major daily newspapers across the country including the Chicago Tribune and the Los Angeles Times. We offer the best ratio of chaperones to travelers—one chaperone for every three or four travelers. Our average group size is 20 and we strive to match the mobility, ages, social skills and capabilities of trip participants. The package price includes roundtrip airfare from the West coast, lodging, all meals at the destination, entertainment, recreational equipment rental, gratuities and transportation at the destination. We also offer optional trip cancelation insurance, spend down options and gift certificates! Trips Inc. has supported CSLN as a sponsor in the past and has recently decided to become a member of this great organization that is an excellent support to people with developmental disabilities! With increasing budget cuts, supported living programs are finding that it is more time and cost effective to have people travel with Trips Inc. rather than the program overseeing the countless details of coordinating an individual’s vacation. At Trips Inc. we know there are many other benefits of traveling with an experienced tour group operator. Each traveler will be supported at the level they need regarding assistance with money and medications. Socially, people are instilled with a sense of independence and given the opportunity to make new friends and share together in new experiences. We invite you to visit our web page to view our upcoming trips, or call our office toll free at 1-800-686-1013 to request a free brochure. We look forward to talking to you!